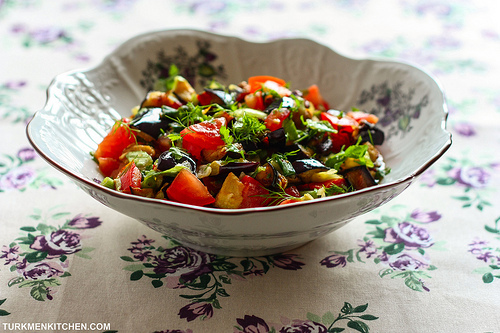 Put the chopped eggplant in a large bowl, sprinkle with ½ teaspoon salt and cover with water. Soak for 15 minutes, then pour out the water. Heat the oil in a deep frying pan. Drop in the eggplant cubes and fry over medium heat, stirring constantly, until golden. Remove the eggplant cubes with a slotted spoon and allow to cool. Combine the tomatoes, lettuce, bell pepper, spring onions, dill, parsley and eggplant in a salad bowl. Add the red pepper flakes and ½ teaspoon salt. Toss well. Mix the garlic and lemon juice together in a small bowl, then drizzle over the salad. This is such a delicious salad! Thank You for creating such a great website of our Turkmen awesome kitchen. Thanks Shahnaz! Glad you like it.